Humans are exposed to potentially pathogenic microorganisms every moment of every day. We are constantly exposed to pathogens in the air we breathe, the things we touch, and the food we eat. Even our natural microbiota harbours potential pathogens and yet we are healthy most of the time.The innate component of our immune system consists of white blood cells that circulate in our blood or live in our tissues that are on constant patrol for invading organisms. Specialized white blood cells called macrophages are particularly important in protecting us from potential invaders. Macrophages are the sentinel cells of the immune response; their role is to detect pathogens through receptors on their surface. Generally they are effective in clearing the pathogen without mounting an inflammatory response; however, when a pathogen evades detection or clearance they are instrumental in mobilizing an appropriate immune response. In some cases a frustrated attempt to resolve infection or an inappropriate response to non-infectious stimuli can result in tissue damage and sterile inflammation. Because macrophage receptors are crucial to this initial interaction to pathogens and shape the downstream immune response, factors that alter the rate or magnitude of receptor expression can have profound effects on an individual’s susceptibility to infection. Research interests in the Bowdish lab including 1) understanding the role of macrophages in initial interactions with pathogens, with a focus on the pulmonary pathogen Streptococcus pneumoniae, 2) determining how age related changes in the immune response contribute to increased susceptibility to infection and 3) elucidating the molecular mechanisms of non-opsonic phagocytosis and 4) understanding how the microbiota contributes to healthy or unhealthy aging. For more detailed descriptions of the research going on in the Bowdish lab see the “Current Projects” page. 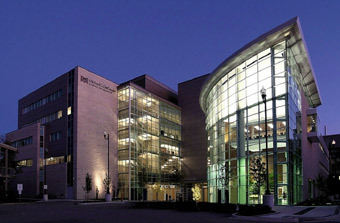 The Bowdish lab is located in the M. G. DeGroote Centre for Learning & Discovery at McMaster University in Hamilton, Ontario, Canada. We are part of the Department of Pathology and Molecular Medicine in the Faculty of Health Sciences and the Institute for Infectious Disease Research and the McMaster Immunology Research Centre. As such we have access to the state of the art facilities at McMaster including the High Throughput Screening Laboratory, the Human Immune Testing Suite and the R.E. Fitzhenry Vector Laboratory. The long term goal of our work is to make major advances in our understanding of host defence against infectious disease. To do this we aspire to understand both the basic molecular and cellular biology of host-pathogen interactions, to utilize novel human models of disease and to find novel ways of translating our work into potential immunotherapies. The work in our lab is creative, innovative, ambitious and collaborative. We aim to be a resource to our colleagues and to train highly motivated students and post-docs to become world class scientists. We are always interested in hearing from motivated researchers who are interested in a career in infectious disease research. To learn a little more about our research, see this video produced by the Research to Reality social media campaign.